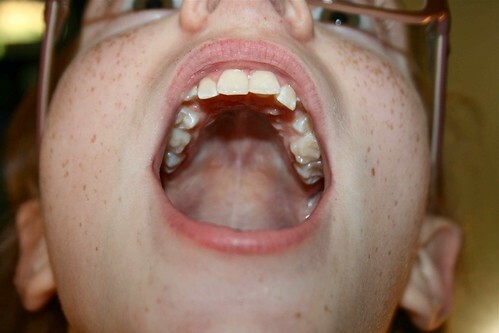 When Mattey was around four she had to have a tooth pulled because it came in decaying when she was one. By the time she was four there wasn't much left to it anymore. Then it became infected. We didn't worry about the hole that was left except to make sure there wasn't any food stuck in it. At a dentist appt. I asked about the hole because it had started getting smaller with her adult teeth coming in. They recommended she see an orthodontist. Good thing Meg already had one. I think it was about 18-24 months ago Mattey got a spacer to keep that hole open. She has been waiting and waiting for the tooth to come in so she could get it out. It didn't slow her down with eating but it annoyed her when food got stuck in it. Today Mat had another growth check up appt. with the orthodontist. I didn't think anything about it because we have to keep going in every 3 months. Well I was sitting in the lobby waiting and waiting. Then I figured out she must be getting it out since I'm usually called back within 10 minutes for the "everything looks good but we're still waiting" speech. Mattey came out to the lobby with a big smile on her face. My suspicions were confirmed. She is now spacer free and loving it. We still have to go back in 10 weeks to make sure everything's alright. I love how watchful the orthodontist is and I really love that all these growth check ups are covered in the one bill. The only thing that topped the spacer removal today was Mickey coming home from a work trip to CA. I'm so glad to have him back. I don't enjoy being a single mother but it was better than I thought it would be. Somebody must have been praying for me. Thanks.